^ Levy, Richard (1978). “Costanoan”. In William C. Sturtevant and Robert F. Heizer. Handbook of North American Indians. 8. Washington D.C.: Smithsonian Institution. pp. 486. ISBN 0-16-004578-9. ^ Pinoy Capital: The Filipino Nation in Daly City. Chandler, Samuel (September 1973). Gateway to the Peninsula. Daly City: City of Daly City. OCLC 799903. オリジナルの2007年10月7日時点によるアーカイブ。. https://web.archive.org/web/20071007084415/http://www.dalycityhistory.org/Gateway.htm. Gillespie, Bunny (2003). 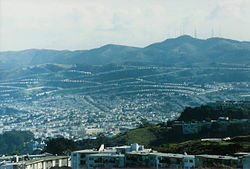 Daly City. Images of America. Charleston, SC: Arcadia Publishing. ISBN 0738528676. OCLC 53875125. http://www.arcadiapublishing.com/mm5/merchant.mvc?Screen=PROD&Product_Code=9780738528670&Store_Code=arcadia&search=CA&offset=0&filter_cat=&PowerSearch_Begin_Only=&sort=&range_low=&range_high=%20%26srch_state%3D1. Keil, Rob. (2006). Little Boxes: The Architecture of a Classic Midcentury Suburb. Daly City, CA: Advection Media. ISBN 0977923649. Vergara, Jr., Benito M. (2009). Pinoy Capital: The Filipino Nation in Daly City. Asian American History and Culture. Philadelphia, PA: Temple University Press. ISBN 1-59213-665-6. http://www.temple.edu/tempress/titles/1920_reg.html.